Creating long-duration, high-powered lasers, for satellites, that can withstand the type of optical misalignment and damage dished out by the unforgiving environment of space, is work that is unique to NASA. It is complicated, specific work, where each step forward is into uncharted territory. In the 1990s, as this technology was first being created, NASA gave free reign to a group of “laser jocks” to develop their own business model and supply the Space Agency with the technology it needed. It was still to be a part of NASA as a division of Goddard Space Flight Center, but would operate independently out of a remote office. The idea for this satellite laboratory was based on the Skunk Works concept at Lockheed Martin Corporation. Formerly known as the Lockheed Corporation, in 1943, the aerospace firm, realizing that the type of advanced research it needed done could not be performed within the confines of a larger company, allowed a group of researchers and engineers to essentially run their own microbusiness without the corporate oversight. The Skunk Works project, in Burbank, California, produced America’s first jet fighter, the world’s most successful spy plane (U-2), the first 3-times-the-speed-of-sound surveillance aircraft, and the F-117A Nighthawk Stealth Fighter. Boeing followed suit with its Phantom Works, an advanced research and development branch of the company that operates independent of the larger unit and is responsible for a great deal of its most cutting-edge research. NASA’s version of this advanced business model was the Space Lidar Technology Center (SLTC), just south of Goddard, in College Park, Maryland. Established in 1998 under a Cooperative Agreement between Goddard and the University of Maryland’s A. James Clark School of Engineering, it was a high-tech laser shop where a small group of specialists, never more than 20 employees, worked all hours of the day and night to create the cutting-edge technology the Agency required of them. Drs. Robert Afzal and Joseph Dallas were directors of the SLTC, and led the development and production of active spaceborne, remote-sensing, optical instruments. As a pioneer in the area of photonics, Dr. Dallas led basic research, development, and production of semiconductor laser diode products, improving coupling efficiency through novel physical optics modeling and intracavity phase-correction techniques. He worked for NASA for 15 years, 11 of which were as a civil servant, and 4 of which were as a contractor. Laser packaging manufactured by Avo Photonics. In the years at the SLTC, Dr. Dallas and the team delivered flight-ready lasers to NASA. The Geoscience Laser Altimeter System (GLAS) space flight lasers, for example, were designed, developed, and assembled at the SLTC. These lasers were integrated at Goddard as part of the Ice, Cloud, and Land Elevation Satellite (ICESat), NASA’s benchmark Earth Observing System mission for measuring ice sheet mass balance, cloud and aerosol heights, as well as land topography and vegetation characteristics. Subsequently, the Mercury Laser Altimeter laser was similarly developed and assembled at the facility and left Earth on August 3, 2004, aboard the MErcury Surface, Space ENvironment, GEochemistry, and Ranging (MESSENGER) spacecraft heading to Mercury to measure the topography of the northern hemisphere. The photonics work performed at the SLTC was on the forefront of a relatively immature branch of scientific study. Contrary to electronics work where engineers have decades of advanced research and flight qualified experience to draw upon, the understanding of issues facing long-duration operation of lasers in space is in its infancy. Drs. Afzal and Dallas and their team of experts, consisting of a specialist in each discipline, managed to do the type of work that could not be performed within a large firm. Eventually, the group disbanded. People left. Programs changed. The amount of work NASA supplied was not steady enough to keep this band of specialists busy or to make the SLTC a viable long-term project. In 2003, Dr. Dallas used the knowledge gained at NASA to found a company, Avo Photonics, in Horsham, Pennsylvania. Dr. Dallas learned how a tech company should run from the unique opportunity of working with a team of specialists performing cutting-edge photonics work. He assembled a new team of hard-working experts to drive Avo Photonics. Because he was supplying more than one customer, NASA, his team would have enough projects to keep themselves busy, while also still being able to promise the same quality of work to its regular customers. And when NASA needed a laser team in the future, it would be able to rely on Avo Photonics, rather than have to assemble a new team every time the need arose. An aerospace and military center, for example, might need a new photonic instrument every 7 years. It can turn to the same provider each time, a group that knows the specific needs of the customer and has worked on their projects before. And, because it is only after 7 years that it requires a new laser, it need not maintain its own laser shop. Avo Photonics can then rotate business to supply its other customers. 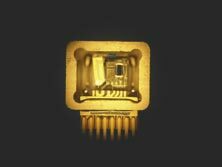 Avo Photonics provides advanced contract manufacturing services for photonic and microelectronic customers in the communications, military, aerospace, medical, and industrial markets. With its state-of-the-art equipment and design expertise for optical and radio frequency products, Avo Photonics is able to support product development from concept through production. Prototyping through volume manufacturing, electro-optic performance testing, high-value design, qualification testing for ruggedness and reliability, fixture development, and lower-cost manufacturing are all part of the company’s standard offerings. Avo Photonics emphasizes a system engineering approach toward the development of solutions for its customers. The strong optical, mechanical, electrical, thermal, and materials engineering design, modeling, and analysis work is continuously guided by the system needs of performance, quality, cost, and schedule. The company understands its customer and meets them at their current level of product design: from fundamental component laser physics to demonstrated product. The engineering and science tools are utilized to move toward cost-effective product realization. This could include aerospace lasers, deployed sensor systems, volume communication lasers, modulators, detectors, industrial ranging systems, or commercial imagers. With over 6,000 square feet of cleanroom space and high-resolution tools such as automated component placement machines, wire bonders, laser welders, lid sealers, optical fiber attach stations, lasers, high-accuracy optical mounts, 20-gigabyte network analyzers, precision cleaning equipment, and optical inspection tools, Avo Photonics is fully capable of seeing a design through to production. Avo Photonics is unique in its combination of high-level engineering support and prototype-to-production facility capabilities. Its customers have a one-stop-shop to see their visions realized. 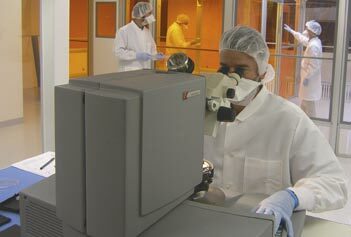 With over 6,000 square feet of cleanroom space and high-resolution tools such as automated component placement machines, wire bonders, laser welders, lid sealers, optical fiber attach stations, lasers, high-accuracy optical mounts, 20-gigabyte network analyzers, precision cleaning equipment, and optical inspection tools, Avo Photonics is fully capable of seeing a design through to production. Understanding and testing designs, processes, and products for various environments is critical to realization of active and passive photonic systems. Avo Photonics has in-house equipment for thermal cycling, high-humidity exposure, hot/cold storage, optical inspection and measurement, gross and fine leak checking, and shear and pull mechanical strength test, along with numerous standard photonic tools such as power meters, spectrum analyzers, thermal sensors, and electrical drivers all customized into LabVIEW-controlled test stations. Customers of Avo Photonics see the company as an extension of their own engineering and production team. The company takes great care in every aspect of product development, from finite element analysis through supply chain management, to detailed reporting and failure analysis. The philosophies realized and nurtured at NASA continue to guide the quality and pride of Avo Photonics. LabVIEW™ is a trademark of National Instruments Corporation.